Practical Grounding, Bonding, Shielding and Surge Protection is a practical engineer's guide to the areas of grounding, shielding and surge protection designed to deliver reliable equipment and communications systems that comply with international and national codes. 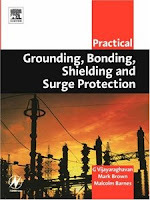 Practical Grounding, Bonding, Shielding and Surge Protection unlike many books on grounding and shielding, provides straight-forward, practical solutions to commonly encountered real-world situations and enables one to better understand proper ground methods and to quickly recognize and solve existing grounding issues in a facility. Also, it covers not only low voltage grounding techniques but also power system grounding, which is generally not well covered in literature. There are some very good examples illustrating how motor start-ups can induce a noise signal in signal cables through capacitive coupling into the conduit supplying the power to the motor. There are also many cases showing how ground loops can be formed and ways to prevent them. The reader will get a very good understanding of proper grounding techniques by reading this book and will also learn about the existing standards for grounding. Readers who would benefit from this book include power engineers, consultants, instrumentation and control engineers, technicians, and anyone who designs layout for power and electronics systems or anyone trying to fix grounding issues.